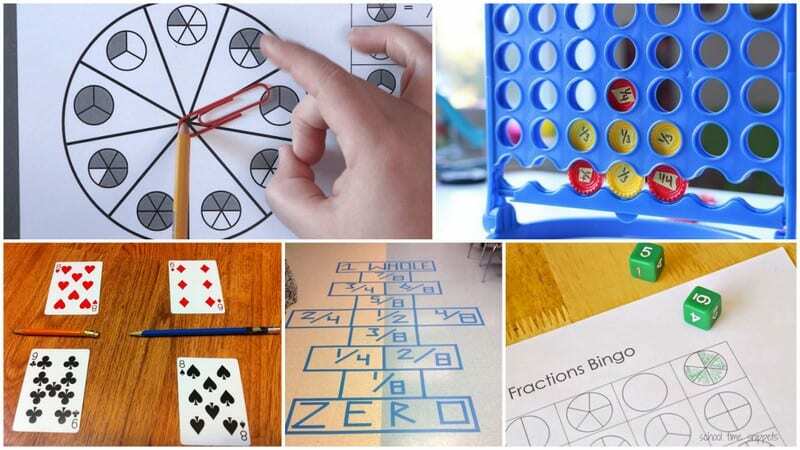 Math wouldn’t be half as fun without games like these. We know. Teaching fractions can be really hard. And teachers need lots of different methods to get those fraction lessons to stick. Well, here are a few more for your arsenal. 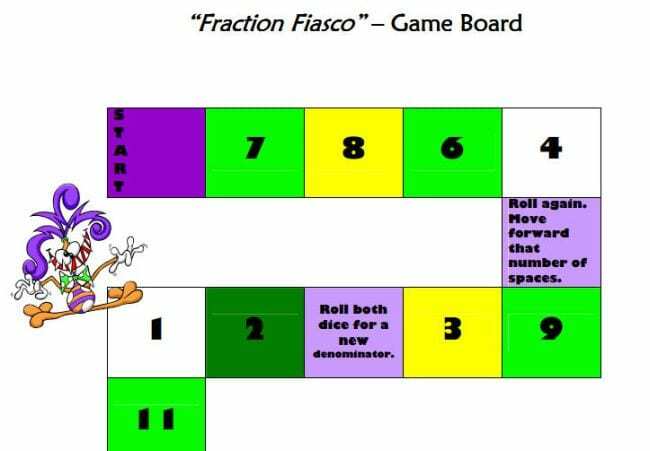 These fraction games for kids boost understanding, critical thinking, and social interaction. Better yet, they’re fun! 1. Fight it out in a fraction war. Your kids probably already know how to play War with cards. This version just adds a fraction aspect. Students deal two cards, a numerator and denominator, then determine whose fraction is the largest. The winner keeps all four cards, and play continues until the cards are gone. You can also play using these free printable fraction cards. 2. 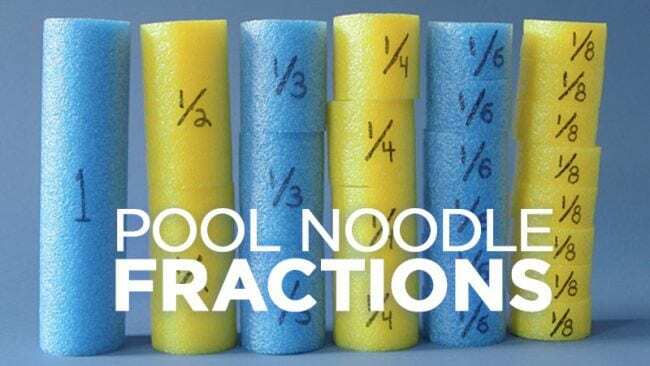 Float some DIY pool noodle fractions. It’s so easy to make these pool noodle math manipulatives, which you can then use for all kinds of fraction games. Learn how to make them and get ideas for using them here. 3. Build excitement with LEGO fraction games. 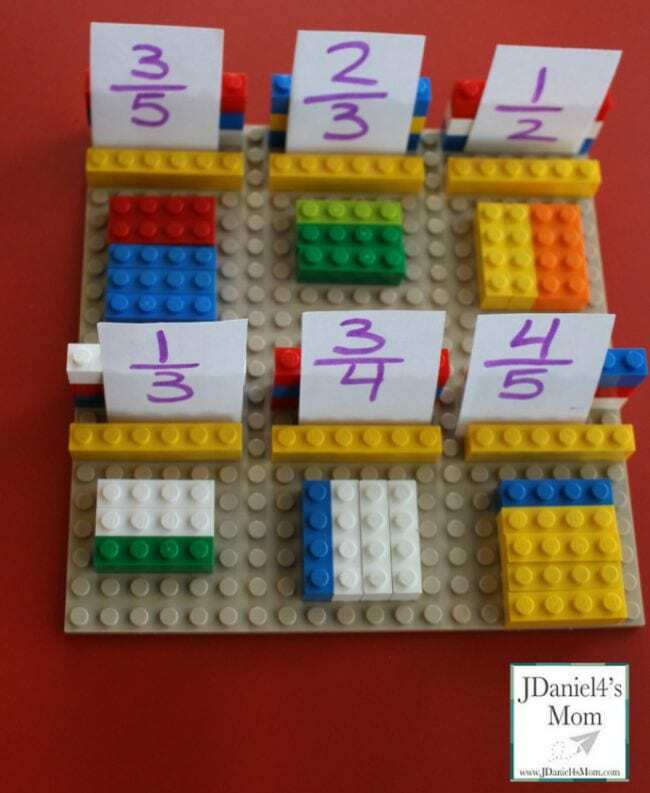 Visualizing what fractions represent is easier (and a lot more fun) when you use LEGOs! Lay them out side by side or build towers. No matter how you play, this is a sure-fire hit. 4. 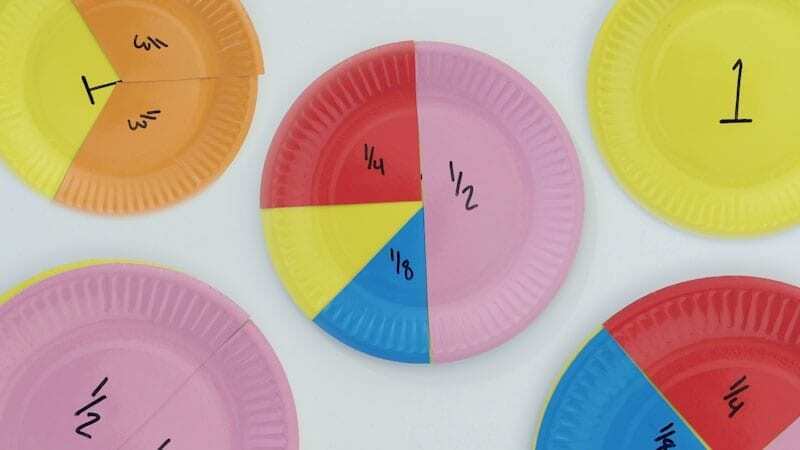 Try making paper plate fractions. Such a fun, colorful way to play with fractions and equivalencies! Get the full instructions here. 5. 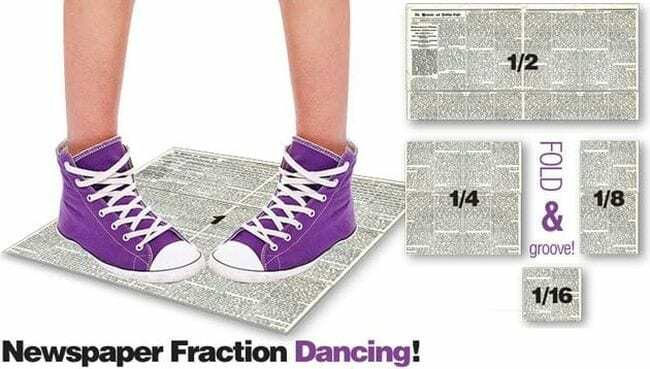 Boogie down with newspaper fractions. Turn the music up! Start out with a full paper as each student’s dance floor, then fold down to one half. Continue folding the paper into smaller and smaller dance floors and watch kids get creative as they try to stay on the paper. 6. 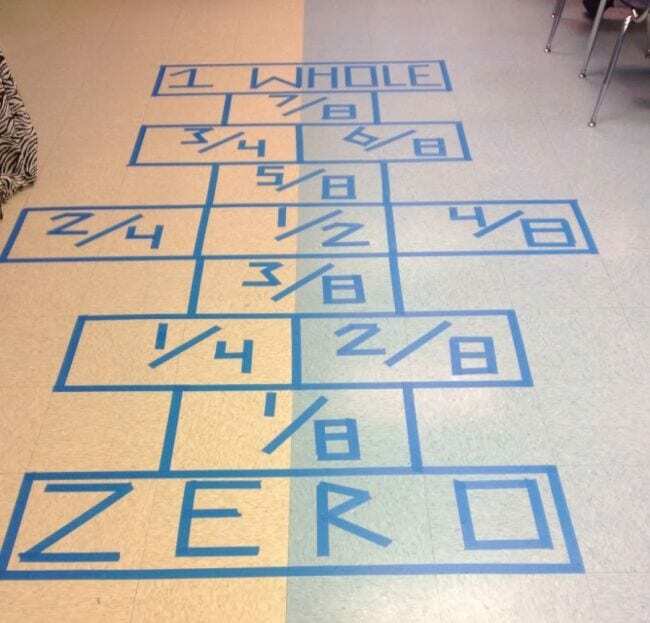 Jump into fraction hopscotch. It’s hopscotch—with a fraction games twist! Draw a hopscotch board on the playground (or outline one with tape on your classroom or hallway floor). Label the squares with fractions instead of whole numbers. Kids throw a marker and jump to where it lands, then name the equivalent fractions for that square. 7. 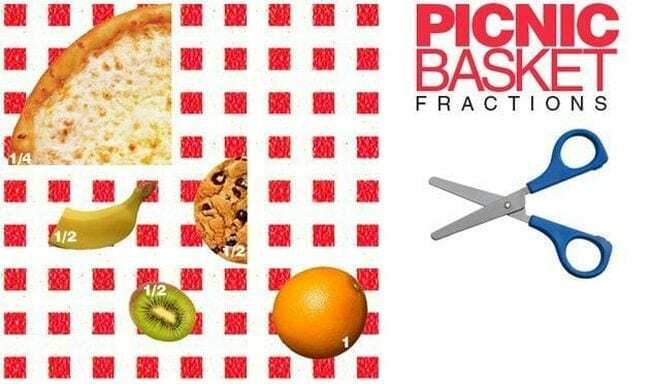 Have a fraction picnic. Provide a variety of food images cut from magazines or printed out from the Internet. Students plan a picnic and choose the food they want to bring along. Using a ruler and scissors, cut portions of their food choices and glue them to a paper plate. Finally, label each item with the fraction name. Bon appétit! 8. 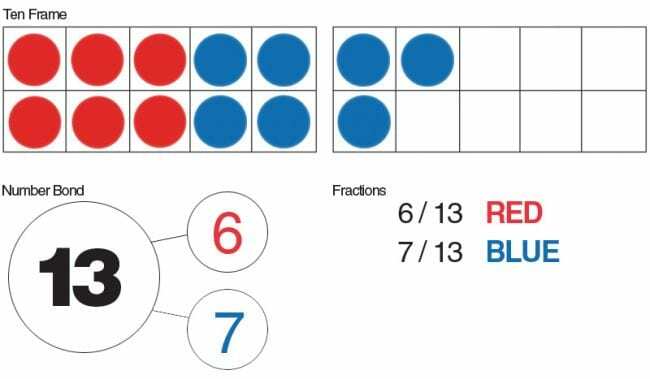 Connect fractions to learn and win. 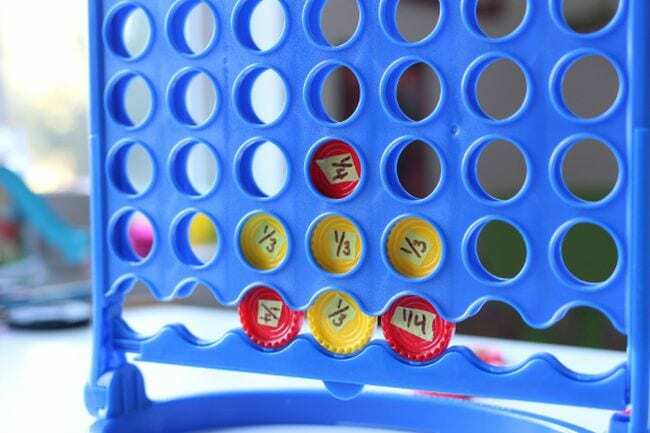 Repurpose a Connect Four set to play fraction games! The goal is to match not only your colors, but the fractions themselves. For instance, you need four one-fourths in a row, but only three one-thirds, so there’s strategy involved, too. 9. 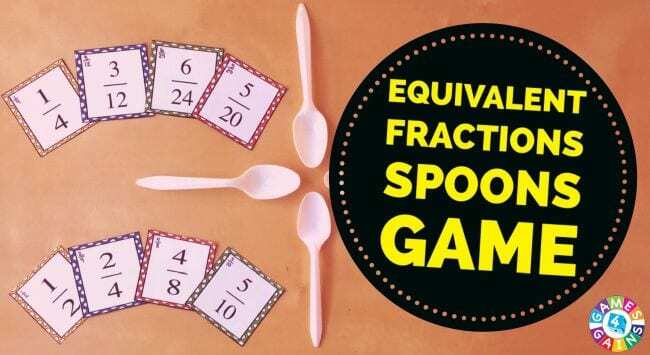 Grab the fun of fraction Spoons. If you’ve played Spoons before you know the drill. Match four of a kind (this time using free printable fraction cards found at the link below), and you get to grab for a spoon—and so does everyone else! The loser takes one letter of the word SPOON, and play continues. 10. Put a spin on the fraction fun. 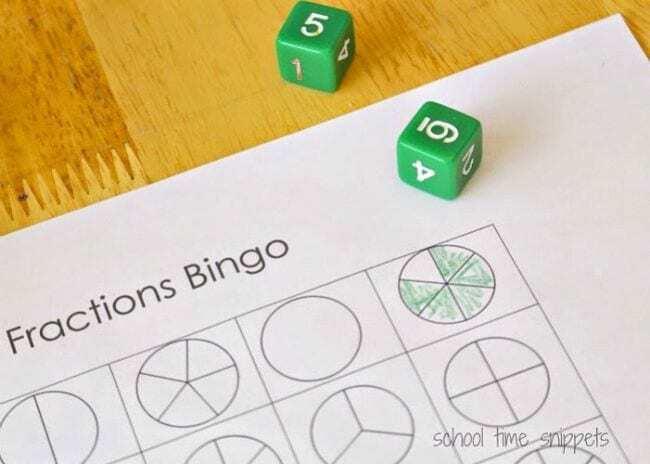 Kids get a kick out of stuff that spins, so they’ll love these free printable fraction games. 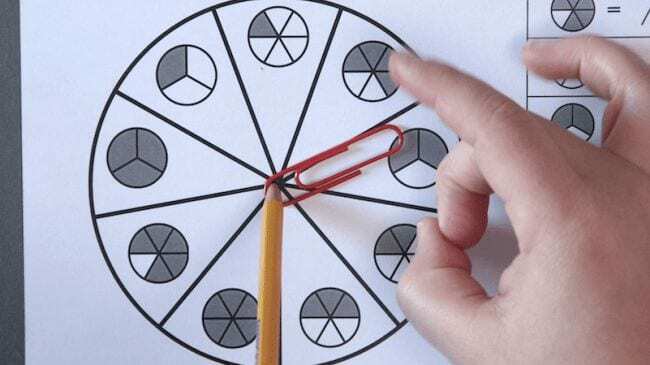 Since the spinners are just pencils and paper clips, every kid can have their own as they practice their fraction skills. Get the whole free set of games here. 11. Color your way to fraction bingo. 12. Reduce fractions and race to the finish. Kids draw a card (the free printable cards and board are at the link below) and reduce the fraction shown. They then move along the board to the next square that matches. First to the end wins! 13. 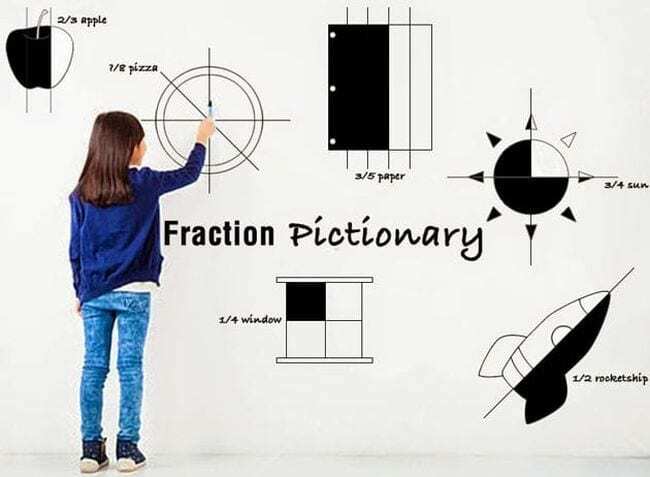 Draw on their creativity with fraction Pictionary. Can you draw a fraction—without using any numbers? That’s the challenge of this fractions game. Kids can draw single objects divided to represent fractions or be more creative. For example, they might draw three apples and two oranges to represent three-fifths. 14. Get into a fraction fiasco. 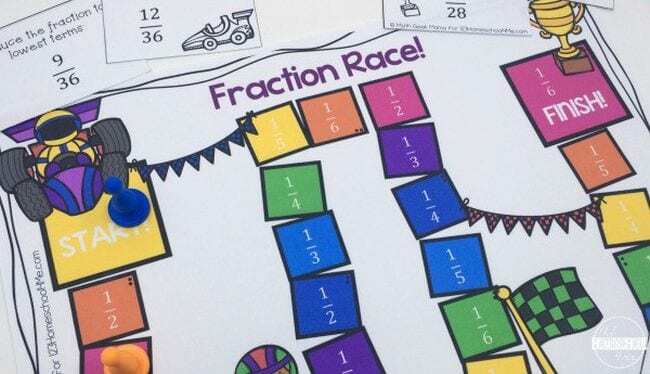 Once they get the rules down, kids will be adding fractions and checking each other’s work in this free printable game. You’ll find all the instructions and the game board at the link below. 15. 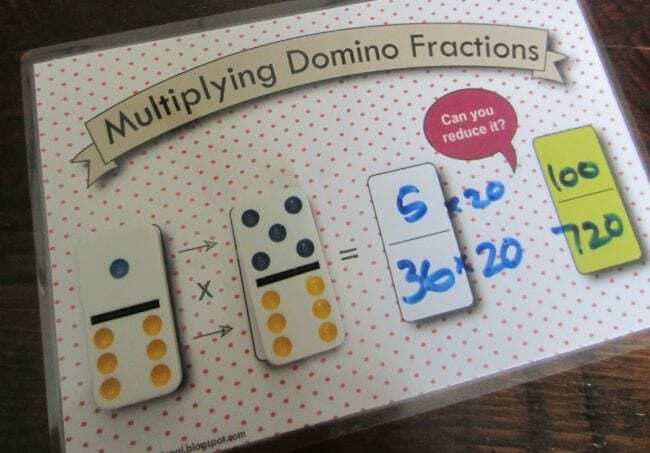 Do the math with domino fractions. Dominoes are like ready-made fractions! Multiply (or add, subtract, or divide) them and reduce the results. Turn it into a race to see who can finish—correctly—first. 16. Play with pattern blocks. 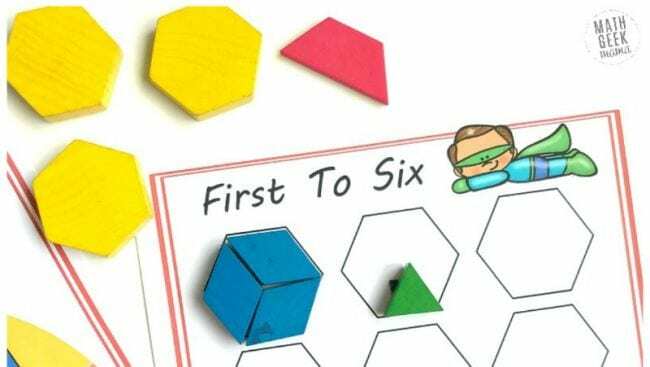 If you’ve already got pattern blocks on hand, put them to good use in some fractions games. In this one, kids spin to find out how many blocks they get to add to their board, in an effort to be the first to build six complete shapes. 17. Shake it up with number bonds. All you need is a plastic cup and two-sided counters. Kids shake the cup and pour the counters on the table, then count how many of each color landed face up. For example, if 13 counters were rolled, six red and seven blue landed face up. Six and seven are both parts of thirteen (the whole). Have students write the number bond and fractions for each color. 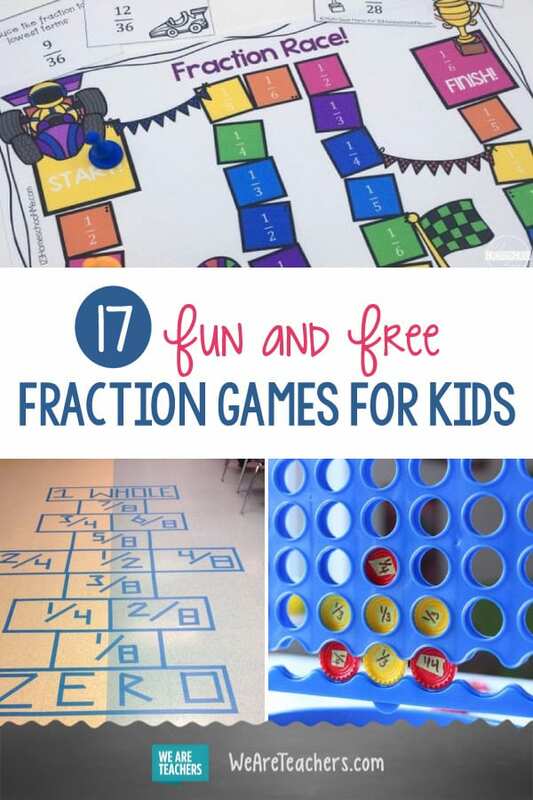 What are your favorite fraction games for kids? Come and share in our WeAreTeachers HELPLINE group on Facebook. Looking for more math games? 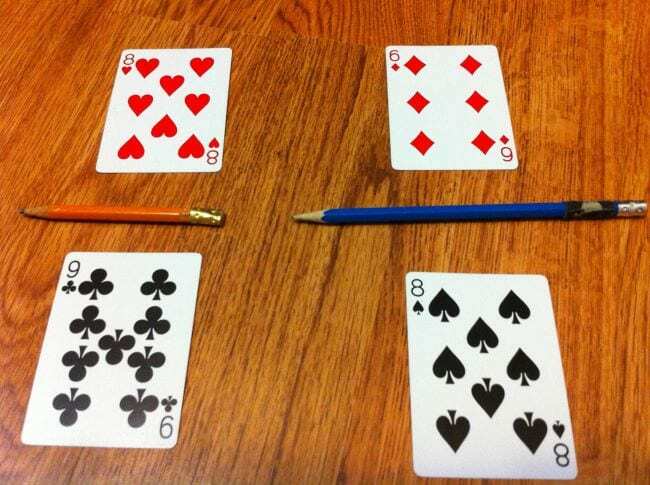 Try this roundup of online math games for every grade level.